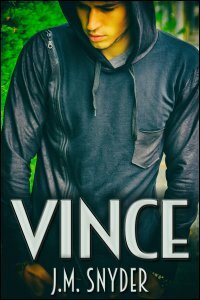 My latest story to get a fresh look is Vince. When I wrote it, I originally envisioned the possibility of returning to the main characters, Vince and Eric, sometime after the second part of the story. Though, to be honest, so much time has passed since then that I no longer know exactly what it was I thought the third part would cover. I guess it might come back to me if I reread the story, I don’t know. To be honest, I’ve considered writing a bunch of short stories revisiting my earlier characters, like Dante and Ryan from Power Play or Stacy, Ange, and Darian from Stepping Up to the Plate. I don’t know if anyone other than myself would be interested, though. I’ll have to see where my muse takes me. Loser. Outcast. Freak. At seventeen, the names no longer hurt Vince Sanford. He’s different from others at his school and always has been — the pep rallies, school dances, name-brand clothes and football games and fifth quarter parties, none of that interests him anymore. There was a time when he did fit in, when his best friend had been Eric Somers, the most popular boy in school. They lived around the block from each other and were inseparable. It was never a question of was Eric eating over or was Vince staying the night — they were one soul in two bodies, sharing two homes, two lives. But something happened between them the summer before high school that tore their friendship apart, leaving Vince with an anger, a hatred, that he can’t control. Now Eric wants back in his life again but Vince is afraid to give him a second chance.